After a fulfilling four-decade career that included leading and developing an award-winning architectural firm (named one of the top ten US design firms in 2006), Barry Thalden retired with his wife, Kathryn (a former Unity minister), in Ashland, Oregon. During the last decade of his work life, Barry became intrigued with his wife’s Unity church philosophy, and also studied and taught the Course in Miracles. 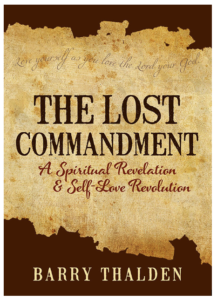 The Lost Commandment is the result of Barry’s study and involvement in humanist and spiritual topics, combined with wisdom he gained from a a life and career of rich life experience and community service and philanthropy.